In the summer of 2000, a Florida family was driving across the Everglades in their Ford Explorer when a rear tire blew and the SUV flipped three times, injuring everyone inside, according to CNNMoney. It turns out both Ford and tire manufacturer Firestone had known for years the tires were faulty. Rather than alerting consumers, they had hidden the problem from the U.S. government while replacing the same tires in other countries. If you’ve been injured in a car accident and a faulty part may be to blame, it’s crucial that you contact a personal injury attorney with the experience and financial resources to properly handle your claim. Ford Motor Co. and Firestone Tires worked together since the company founders met each other about 100 years ago. The longtime corporate partners protected their business interests over the safety of drivers when they kept mum about problematic Firestone tires – many of them originally mounted on Ford Explorers. 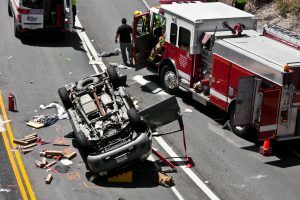 The treads would suddenly separate at highway speeds, too often followed immediately by a rollover crash. But in 2000, a tip from a plaintiff’s lawyer prompted Texas TV news station KHOU-TV to air a segment highlighting the large number of personal injury claims stemming from crashes related to the shredding tires. The segment drew numerous calls from people with their own stories of problems with the tires, and the ensuing influx of complaints to the National Highway Traffic Safety Administration (NHTSA) prompted an investigation that eventually led to the largest tire recall in history. Plaintiffs’ attorneys had been pursuing claims against Ford and Firestone for crashes stemming back to 1992, when a crash in Los Angeles killed two people. Another in Texas in 2000 caused a mother of two to become paralyzed, according to the New York Times and other sources. By 2000, Bridgestone/Firestone Tires had tracked 193 personal injury claims, 2,288 property damage claims, and was a defendant in 66 lawsuits, according to one document published by NHTSA. The suits were related to the ATX, ATX II and Wilderness AT tires used mainly on Explorers and other Ford vehicles. Meanwhile, in 1999, drivers in Saudi Arabia, Venezuela and other countries reported sudden failures of Firestone tires, according to the Wall Street Journal. Eventually 46 deaths would be counted in Venezuela alone, where Ford chose to replace tires on Explorers. A January 1999 memo shows Ford suspected Firestone was covering up problems experienced in Saudi Arabia.1 Neither company notified NHTSA, so it wasn’t until the flood of complaints in 2000 that NHTSA began investigating. On the other hand, Ford, having rejected the tire model recommended by its engineers, still had a stability issue in the Explorer to compensate for. The car maker recommended inflating the tires to a pressure of only 26 psi, meaning the tires were subject to greater friction against the road.4 Most of the tire failures happened in southern states here and hot-climate countries, and Firestone claimed the friction from the low inflation of the tires contributed to the tires shredding. Even when a tire does blow, a car should be designed to allow drivers to pull over without rolling over. Again and again, the Explorers flipped. Plaintiff’s attorneys and Firestone have argued problems in the Explorer’s design made it more likely than other vehicles to roll after a tire blow out. In more recent years, evidence has surfaced that Ford engineers knew they should strengthen shock absorbers on the Explorer and have questioned the SUV’s roof strength as well, according to a 2010 report by the Washington Post. NHTSA sided with Ford and blame fell solely on the tires, which are covered by a separate warranty from the vehicle. Firestone recalled 6.5 million tires in 2000, and when NHTSA investigations continued, Ford itself recalled another 13 million. Then, NHTSA issued a mandatory recall of 3.5 million tires, removing from the roads the last of the Wilderness AT tires made before 1998. The repercussions included new federal law to tighten down on the automobile industry. The TREAD Act requires an auto maker to report to NHTSA when the company issues a safety recall or has a safety campaign in another country. Car manufacturers also have to notify NHTSA about reports of injury or death and provide relevant data about defects. Finally, the TREAD Act assigns criminal liability when a vehicle manufacturer violates the reporting requirements and a defect later causes a death or serious injury. The lawsuits didn’t stop there. In 2001 Firestone paid $41.5 million to end lawsuits brought by several states. It paid out more than $149 million to settle class action lawsuits. Then the tire manufacturer paid its one-time business partner, Ford, $240 million in recall claims related costs. What should be most remembered, though, is the human cost. The death toll in this case of corporate inaction and cover-up stands at 271 in the United States. Those injured number 823. Investigations and regulations came too late for them. Personal injury and wrongful death cases have been the exclusive focus of Suk Law Firm since 1988. Our knowledgeable attorneys have the expertise and resources to fully develop your claim and see it through to a trial if necessary. We have recovered more than $125 million on behalf of victims and we are ready to assist you. 1 The Ford-Firestone Case Authors: Pinedo, M., Seshadri, S., & Zemel, E. – NYU Stern School of Business. 2 Firestone’s Tire Recall. University of New Mexico, Daniels Fund Ethics Initiative. 3 Strikes, Scabs, and Tread Separations: Labor Strife and the Production of Defective Bridgestone/Firestone Tires Author(s): Alan B. Krueger and Alexandre Mas Source: The Journal of Political Economy, Vol. 112, No. 2 (April 2004), pp. 253-289 Published by: The University of Chicago Press Stable. 4 Firestone Tire Defect and Ford Explorer Rollovers: Testimony of Public Citizen’s President Joan Claybrook to the Committee on Commerce, Science and Transportation, September 2000. 5 Separations, Blow-Outs, and Fallout: A Treadise on the Regulatory Aftermath of the Ford-Firestone Tire Recall, 37 J. Marshall L. Rev. 1073 (2004).